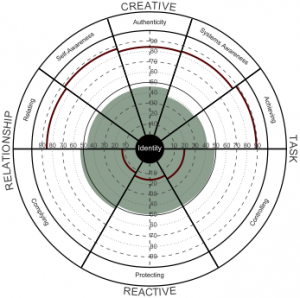 The Leadership Circle™ is a powerful self-awareness tool that measures not only leadership competencies that creatively enhance our effectiveness and well-being, but also any reactive tendencies that reveal internal assumptions that can limit effectiveness, authentic expression and empowering leadership. The Inner Circle of the profile is depicted below. The profile is a 360° assessment which means you gain the detailed view of those around you (including bosses, peers, direct reports). The profile will reveal any gaps or blindspots, where how you see yourself differs markedly with the views of others. This can often represent confirmation of suspicions… or a complete and unsettling surprise. This enhanced self-awareness base can direct developmental attention and executive coaching support. The development of The Leadership Circle has been underpinned by extensive research. It references a number of frameworks, most notably Robert Kegan’s Stages of Development and Social Maturity, as well as work by organisational thought leaders such as Peter Block (author of The Answer to How, is Yes), Peter Senge (author of The Fifth Discipline), and Robert Fritz (author The Path of Least Resistance). Robert Kegan, Meehan Professor of Adult Learning and Professional Development at the Harvard University Graduate School of Education, has been a member of TLC’s Advisory Board since 2011. Beyond individual assessment, the TLC Culture Survey (LCS) measures the impact of the predominant leadership practices of the organisation or business unit. It places a spotlight on the gaps between the actual culture and the culture the organisation aspires to. The gaps that are revealed provide insights for focused improvement. Tom is certified in the Leadership Circle Profile and can be contacted at tom[at]tomloncar.com.au to answer your questions on how it might work for you.